Dubai: Royal Jordanian Airlines has decided to stop all its services to Mumbai and Delhi as part of its restructuring plan. RJ will stop operating to Mumbai on September 10 and to Delhi on October 31, this year. The airline is also shutting down its Lagos route with effect from October 10. With the closure of the three destinations, the RJ routes will count 51.
RJ Chairman of the Board/President and CEO Nasser Lozi said that the decision is part of a synchronised plan to turn around the airline covering operations and financial structure. The move comes at a time whilst RJ is facing difficulties due to the instability in the region and high fuel prices. Lozi attributed halting these flights to the reduced demand on travel from/to these cities due to the aggressive growth of regional competition and increased operating costs. He added that shutting down the three destinations raises the number of destinations that RJ has stopped this year to eight. He said that RJ suspended its flights to Alexandria, Colombo, Milan and Accra last April and May. He also said that RJ continually studies the opportunities for new routes. There are a number of regional markets that RJ is watching closely. Regarding its fleet, Lozi said that the airline is awaiting the arrival of the Boeing 787s which will start joining the fleet in August this year. By year end, the airline will be receiving five B787s. Lozi also said that the airline had to suspend operations to seven stations in the Middle East and North Africa due to security reasons in the region; they are: Damascus and Aleppo since more than two years, in addition to Tripoli, Benghazi, Misrata, Mosul and Tel Aviv. 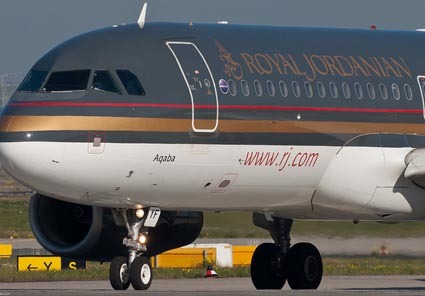 He stressed that Royal Jordanian suffered big losses in 2012 and 2013, as a result of suspending service to Damascus and Aleppo and also changing the route of its operations between Amman and Beirut.